This year, Gardening Know How’s School and Community Garden Sponsorship Program was fortunate enough to help support 20 gardens with $1,000 each. These gardens represent a wide array of community and school programs, from Florida to Saskatchewan and many places in between. Each has its own unique and powerful story, and we’re excited to share them with you. Every other week we’ll highlight one of our sponsorship recipients to help spread the word about how amazing they really are. This week we’re featuring the Summerloch Green Community Garden. Summerloch Green is a small retirement community in Casselberry, Florida, a city of about 26,000 people. While the community has several recreational activities, it’s always gone without a garden. And with a large number of its residents living on social security checks alone, fresh produce hasn’t always been at the forefront in everyone’s kitchens. That’s going to change this year, however, as the Summerloch Green Community Garden breaks ground in its first season of operation. The brand new garden board has been given a given a piece of land by the community, and as we speak, it is being leveled and graded to create a “blank canvas where we expect to create a masterpiece,” according to Raymond Simmons, one of the masterminds behind the new garden. Soon the beds will be installed, including several elevated beds specifically designed for the inclusion of elderly and handicapped community members. A few prototypes have already been built. Once the beds are in place, it’ll be time for planting under the supervision of a resident Master Gardener. The planting will begin with vegetables and herbs that will be donated to the community’s food bank, a service so many residents rely upon. Since Casselberry is located in central Florida, it’s gifted with a near year-long growing season and will be able to provide fresh produce the whole year through. With the grant from Gardening Know How, the Summerloch Green Community Garden will be bringing its residents fresh local food and giving them a place to get in touch with nature and put their hands in the dirt. We’re proud to be able to help them realize this dream. Very good. I volunteer in a community garden in Ross on Wye in England. We have raised beds at ground level 2.5x 1.5 meters, one per member. The members have some real challenges and the small enclosed gardens gives them containment, security and a sense of accomplishment. We have high beds also but these are deep veg trugs, with a V shaped plant box. Yours look easier to build. There are several disabled wheelchair users who have not gardened for years but now have restarted. Watching them working their high beds is one of my greatest pleasures. Keep going. Liz Baessler! Enjoyed the article about the Summerloch Community Garden. You might ask around the area for Master Gardeners who could help get it started and keep it going! 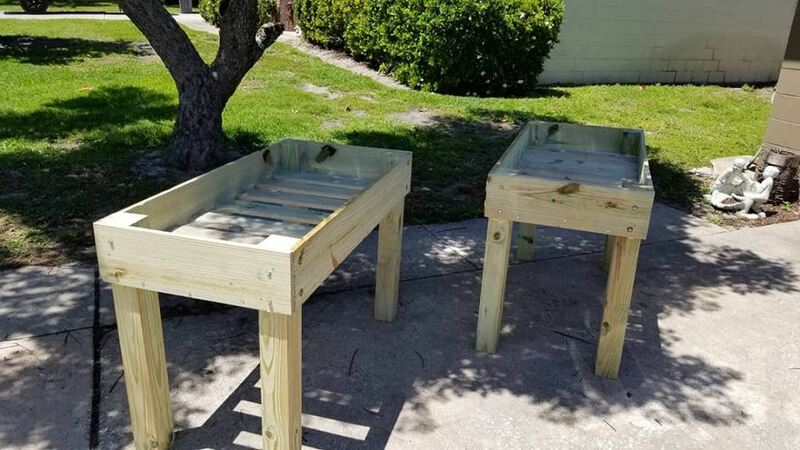 Master Gardeners in Mississippi are making use of the "Salad Garden Structures" for children and elderly use.